In 1988, the musical landscape was forever changed when hip-hop group NWA (N****s With Attitude) hit the charts, radios and stages across the globe. A story whose telling is long overdue (as Ice Cube rightly points out, there are plenty of Elvis films out there), Straight Outta Compton charts the politically-charged history of one of the world’s most famous musical groups. The film follows the now-legendary careers of seminal hip-hop artists Dr Dre, Ice Cube, Eazy-E, DJ Yella and MC Ren from the beginning, when they first accepted the tutelage of veteran manager Jerry Heller. Straight Outta Compton is all about how the group, with their unapologetic style, went about acquiring fame and fortune as well as leaving an indelible mark on today’s music. Disappointingly (but not surprisingly) the misogynistic aspects, specifically Dr. Dre’s alleged violence against women, were left out of the film. Cramming over ten years worth of turbulent history into a two hour film is difficult at best and it is somewhat understandable that some things were left out of the story. The film is produced by two of the surviving members of the group, Ice Cube and Dr. Dre. Arguably they are the best people to tell this story, however they are also the most biased. It is therefore very difficult to believe that the sexist, ugly parts of the NWA’s history were left for any reasons other than it makes the members look bad and detracts from the film’s main story – the story of these men striking a blow for victims of racism. Casual tolerance towards gendered violence, and the excusing of artistically successful men of their rampant misogyny, is not something that exists in a vacuum. In 1988, the same year the NWA gained international success, Sean Penn tied his then-wife Madonna to a chair and savagely beat her for several hours. This incident was widely publicised and then quietly swept under the rug. Google Sean Penn and the suggestions come up with “movies,” “height” and “IMDb,” in that order. The public not only forgives but forgets these repellent, heinous crimes. This cultural amnesia lead to the inescapable conclusion that as long as a man creates an art form that is popular in some way they can be forgiven for the most vile assaults imaginable. Meanwhile, victims that are still alive get to watch as the world lavishes love and money onto these criminals. 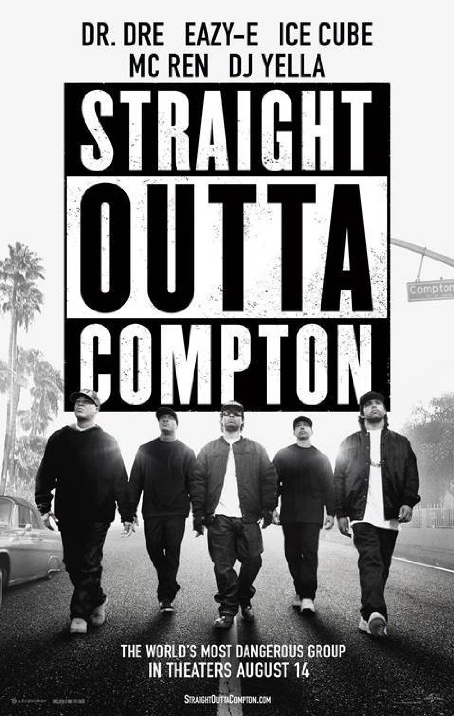 Having said all this, it is undeniable that Straight Outta Compton is a film with merit. The African-American population of the United States still experience deeply entrenched social, political and economic oppression. The NWA took the brutal experiences they had with the police and expressed themselves unapologetically through music, and rightly so, as the injustice they experienced was appalling. What is baffling is that while these artists crusaded for equality and for the right to have their voices heard they routinely contributed to the oppression of another marginalized group. Watching this film will no doubt give the viewer insight into the kind of oppression African-Americans experience on a daily basis. A key lesson to be learned from this film is that one cannot overcome oppression by contributing to another. I would never presume to speak for African-Americans – I have no right to – but Straight Outta Compton has contributed to my understanding of exactly how complicated oppression is.